General Eisenhower invited members of Congress and journalists to see the newly liberated camps so that they could bring the horrible truth about Nazi atrocities to the American public. In late 1944 and early 1945, as Allied troops defeated the German army and moved across Europe into Germany, they encountered tens of thousands of concentration camp prisoners. Soviet forces were the first to approach a major Nazi camp, reaching Majdanek near Lublin, Poland, in July 1944. Later, the Soviets liberated Auschwitz, the largest killing center and concentration camp, in January 1945. In the following months, the Soviets liberated additional camps in the Baltic states, Poland, and eventually in Germany itself. In April and May 1945, the British liberated Nazi camps in northern Germany, including Bergen-Belsen and Neuengamme. Seeing the Nazi crimes committed at Ohrdruf made a powerful impact on Eisenhower, and he wanted the world to know what happened in the concentration camps. On April 19, 1945, he again cabled Marshall with a request to bring members of Congress and journalists to the newly liberated camps so that they could convey the horrible truth about Nazi atrocities to the American public. 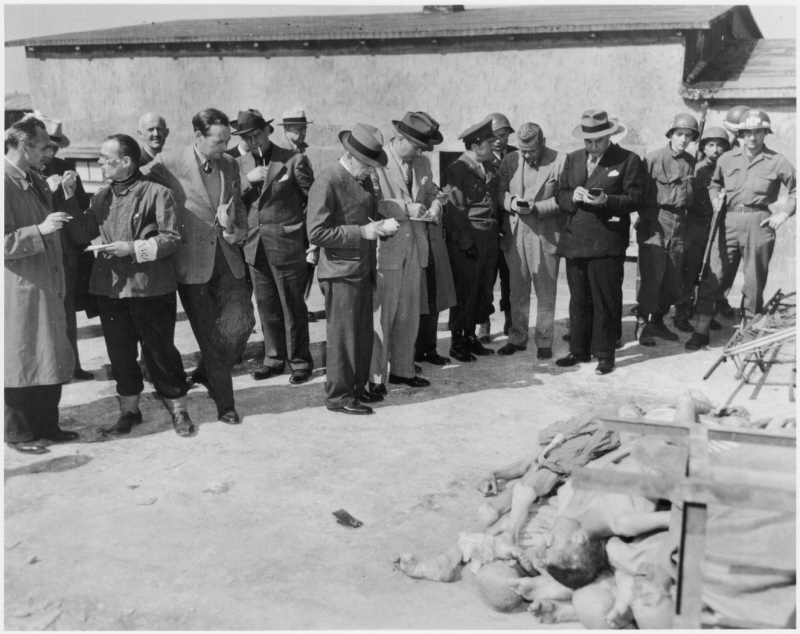 Within days, congressmen and journalists began arriving to bear witness to Nazi crimes in the camps. The discovery of the Ohrdruf camp, and the subsequent liberation of Dora-Mittelbau (April 11), Flossenbürg (April 23), Dachau (April 29), and Mauthausen (May 5) opened the eyes of many US soldiers and the American public to the horrors perpetrated by the Nazis during the Holocaust. April 20 - 27, 1945 News about General Eisenhower's invitation to members of Congress and the press. April 20, 1945 - May 31, 1945 News, editorials, opinion pieces, letters to the editor, and political cartoons reporting on Congressional delgations and journalists visiting the liberated camps. April 5, 1945 - May 15, 1945 News about American liberation of concentration camps (e.g., Buchenwald, Dachau, Flossenbürg, Mauthausen). April 1945 - June 1945 Editorials, opinion pieces, letters to the editor, and political cartoons responding to the liberation of concentration camps.